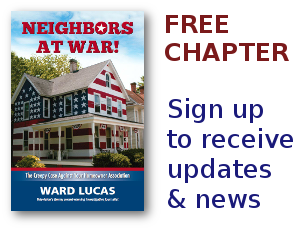 CAI Archives - Neighbors at War! A Free CAI Vacation! How Sweet! 1 Comment on A Free CAI Vacation! How Sweet! All those board members and lawyers are having another annual convention, all at the expense of homeowners across the country. This time they’re gathered in the shadow of ‘the Sleeping Giant’ in Scottsdale, Arizona. Only the best for our CAI, right? You’d think they could save some money by holding their convention in a motel in Boring, Oregon. But, no, they desperately need to spend homeowners’ money in the fanciest resort in the U.S.
As many of you know, Arizona’s George Staropoli is one of the pioneers and heroes of our movement. I just wish I had his IQ and his intellect. In the essay linked below he performs surgery on the lie that HOA industry representatives constantly spread through our legislatures. Print it out and place it on the desks of each man and woman in government. CAI maintains HOAs are protected by and do not violate the Constitution — not so!